CES 2018: SAMSUNG announces new Notebook 7 Spin (2018). 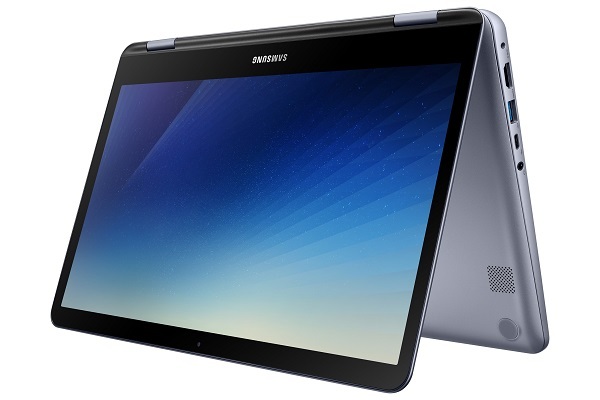 Samsung Electronics today announced the new Notebook 7 Spin (2018). The Notebook 7 Spin (2018) offers modern features including a 360-degree touchscreen for added convenience; an Active Pen (sold separately) for quick and easy note-taking; as well as the power and performance for more efficient multi-tasking. The new Notebook 7 Spin (2018)'s 13-inch 360-degree rotating touchscreen offers the flexibility to view content as preferred, whether it be as a tablet or as a traditional PC in landscape mode. Runs on Windows 10 operating system and equipped with an Intel i5 processor, 8GM RAM and 256GB SSD drive that allows for quicker startups and advanced multi-tasking capabilities. Studio Plus - For users who wish to express their creative side, Studio Plus allows them to produce personalized movies featuring their favorite photos and videos. The Samsung Notebook 7 Spin (2018) will be available in select countries starting in the first quarter of 2018 in the U.S.